As has been said here, it is awfully difficult to tell which pattern is suitable for 18th century clothing and which isn't. To help you educate your eye, I have collected a few pictures of "good" and "bad" examples. Wrong kind of flowers. The distribution of the pattern would be OK for after 1750, but Chrysanthemums didn't play any role in European fabric patterns of the time. The colouring would only have been possible in silk. Wrong layout. Flower patterns tend to be sinuous while this one is almost circular. Violets aren't typical, either. They are shaded. 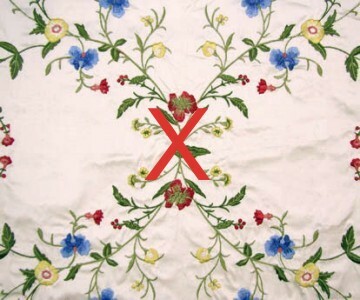 Only embroidered or brocaded flowers and leaves were shaded - the ones in above two examples are embroidered, but by machine. The colouring could only be achieved in silk. Too realistic. The blooms have perspective and are strongly shaded. 18th century flowers are more stylised, even if brocaded. That violoet? No. Too dense, too... fuzzy. The stylization of the flowers is OK, though. To realistic colours and shading, too 3-dimentional. Late Victorian interior decoration, I'd say. Maybe not even that. Again, too much detail and shading. Very upholstery. Too realistic still, too colourful. 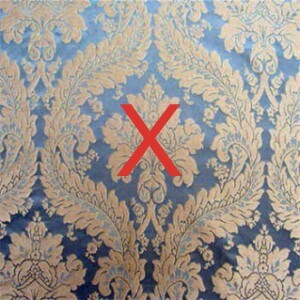 Technically this could only be done in silk, but for a silk brocade, it's the wrong layout. 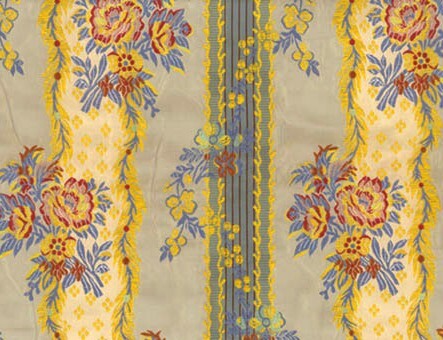 One of my favourites: Early 20th century bed linens. Please use them for your bed! The layout and stylization aree close, but especially the stems are too realistic. This wants to become a curtain. Toile de Jouy. Interior decoration only..
Pattern and colours would be OK - but this is machine-embroidered rather than brocaded. And it shows! Machine embroidery doesn't fool anyone. Too colourful, noo... naive, almost like it was meant for a child's room. And shading, bloody shading! The pattern layout and distribution of flowers are correct. Shading is done as distinct zones only, i.e. stylised. Flowers in various shades of red are typical. However, the leaves are too vividly green. I'd expect a more bluish hue. A typical calico print pattern. The loose layout is suitable for the late 18th century, especially ofter 1770. The colurs are a bit too uniform, but technically possible. The flowers are well stylised. This could be a block print or embroidery. Such a striped layout is found mainly fater 1760/65. 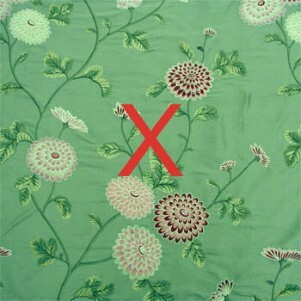 The flowers are stylised and don't have their natural ccolours. 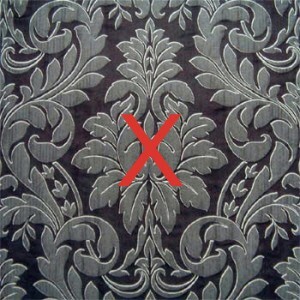 A pattern like the above would be done in in silk brocade, never printed. This is my favourite: On the left, a repro by Den Haan & Wagenmakers. On the right, an original garment found on the Het geheugen van Nederland website. See it? Two more from den Haan & Wagenmakers. The patterns are very small - more suitable for late in the century. 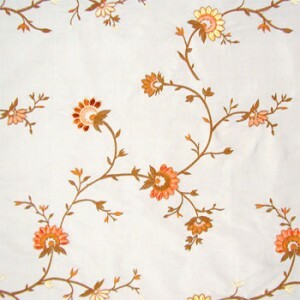 Off-white, red, blue and brown are suitable ground fabrics. 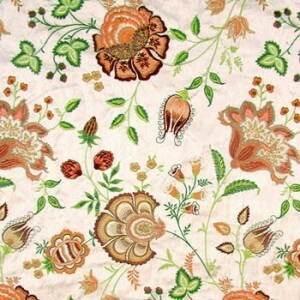 A modern Indian block-printed fabric with a pattern also found in European Indiennes. In the 18th century, chintzes were also made in their native India for export to Europe and America, or even made into banyans locally, then exported. Many modern Indian block prints, however, are unsuitable because the blocks were sloppily placed so that e.g. 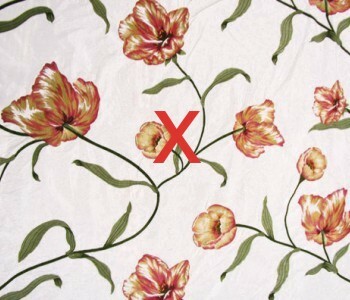 the red of a flower appears outside the black line that was supposed to outline it. Another Den Haan & Wagenmakers. The size suggests a relatively early date (mid century or before) and the number of colours (with added yellow!) suggests a relatively expensive fabric. A couple of years ago IKEA repoduced some patterns from the Musée de l'Impression sur Etoffes. This is one of them, Alvine Blom. Out of stock, alas. IKEA again. The pattern is way too big for clothing, but if it was closer, it could be taken for an indigo resist dye job. This is an even earlier (late 1980s I think) IKEA fabric, IIRC the imprint on the edge says it's a repro of a fabric in Drottningholm. The pattern is a bit on the big side (the original probably was interior deco), but it could just do. IKEA again. More for later 18th century, being so delicate. Again, a bit on the large side. also IKEA. Still Sweden, but this time it's Duran Textiles. They specialise in repros.